Diabetic Nephropathy — also known as diabetic kidney disease — is a well-known complication of diabetes. In fact, out of all the causes of kidney failure, diabetes accounts for nearly half of all cases. Nephropathy can lead to lifelong dialysis, the need for a transplant, and it can be fatal. Fortunately, diabetes-related kidney disease can be treated and managed, and in some cases, reversed. For those with healthy kidneys today, nephropathy is largely preventable, too. 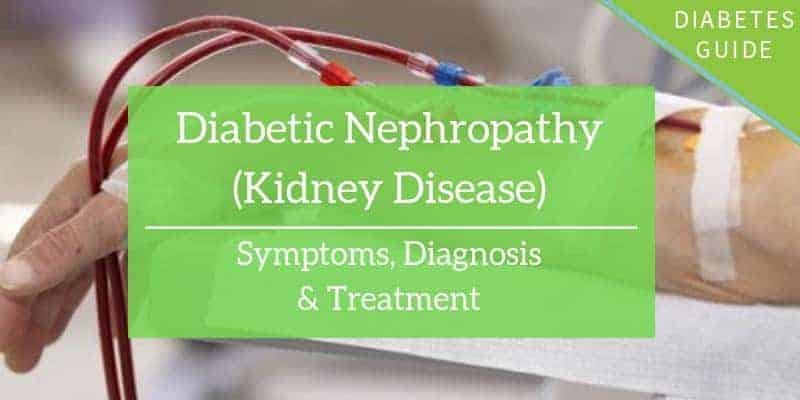 In this article, we’ll look at why diabetes can cause nephropathy, the 5 stages of nephropathy, the symptoms, treatment options, and how to prevent it from worsening or developing in the first place. In a healthy kidney, there are millions of small blood vessels with extremely small holes that act as filters, explains the American Diabetes Association. Whatever waste passes through those small holes is then excreted through your urine. In a person with diabetes, there are 3 ways that chronic high blood sugar levels damage the entire system of managing your body’s urine. Normally, larger substances like non-waste protein and red blood cells cannot pass through these holes. However, long-term damage from high blood sugar levels in people with diabetes can severely damage your kidney’s normal function. The higher your blood sugar levels are, the more blood your kidneys have to filter and process. Over time, this extra stress on your kidneys can cause leakage through those formerly tiny holes — and that means protein can begin to leak through those holes, too. When protein is present in your urine, it’s referred to as microalbuminuria. High blood sugar levels can also damage the nerves throughout your entire body — including the nerves in your bladder that communicate with your brain. These nerves, explains the NDK, tell your brain that your bladder is full and you need to use the bathroom. When these nerves are damaged, you’re unaware that your bladder is full. Over time, the additional pressure from a full bladder causes damage to your kidneys. Lastly, the urinary tract suffers as a result, too. When urine stays in your bladder for too long — and your blood sugar levels are consistently high — you have a high risk for developing urinary tract infections, also known as UTIs. The excess sugar is passed through your urine feeds the growth of bacteria in the collection urine. UTIs generally affect the bladder, but severe infections can spread to your kidneys, too. While UTIs can be treated, they will easily come back if blood sugar levels are still consistently high because there is still a significant amount of glucose in your urine feeding the growth of any present bacteria. The best way to prevent a UTI as a person with diabetes is to work with your healthcare team to lower your blood sugars immediately. In other words: how well your kidneys are filtering and functioning. There are truly no symptoms in the earliest stages of diabetic kidney disease which is why scheduling regular check-ups with your primary care team are critical for catching kidney issues early on when it’s still reversible. As a person with diabetes, you may have been asked to collect urine in a cup at the doctor’s office — or in a large plastic jug over the course of 24 hours at home. This collection of urine is generally used for testing the amount of protein in your urine. The test can be done very quickly — sometimes before your doctor’s appointment even ends. When protein is detected in your urine, it’s called “microalbuminuria.” The greater the amount of protein, the more your kidneys are struggling to function properly. Let’s take a look at the five stages of nephropathy and what they mean for your long-term wellbeing. These are the five stages of nephropathy or kidney disease as defined by the American Diabetes Association. “Stage 1 is characterized by early hyperfunction and hypertrophy,” explains a journal in Diabetes Care, which is determined through testing your urine for microalbuminuria. Patients are generally at Stage 1 when diagnosed unless they had not been seen by a doctor in a number of years while blood sugar levels were consistently high. For many patients in Stage 1, reversing kidney disease is possible by managing blood sugar levels with support from changes in nutrition and exercise habits, as well as starting a diabetes medication, including insulin. The first and foremost priority is lowering blood sugar levels as quickly as possible to prevent further damage to the kidneys. These changes are found at diagnosis, before insulin treatment. Increased urinary albumin excretion, aggravated during physical exercise, is also a characteristic finding. Changes are at least partly reversible by insulin treatment. “Stage 2 develops silently over many years,” explains Diabetes Care. This stage is also characterized by lesions on the kidneys even without other signs of the disease aside from GFR test results. For those in Stage 2, albumin tests can look normal, but testing shortly after physical exercise can quickly reveal higher test results and clear kidney disease. High blood sugar levels will also reveal higher albumin levels at rest or during and after exercise. Many patients can live long lives with Stage 2 kidney disease if they are able to improve other aspects of their health around blood sugar levels, quitting smoking, and nutrition. Stage 3 nephropathy is measured by “radioimmunoassay,” explains Diabetes Care. This is a test that looks at antibody levels using a radioisotope and measuring radioactivity. “A level higher than the values found in normal subjects but lower than in clinical disease is the main characteristic of this stage, which appeared to be between 15 and 300 μg/min in the baseline situation,” says Diabetes Care. Increasing blood pressure levels also play a significant role in Stage 3. Stage 4 is defined by Diabetes Care as “overt diabetic nephropathy,” and is characterized by constant and persistently high levels of protein in your urine. If a patient has high blood pressure, and it isn’t being managed adequately, kidney function will decline quickly in those with Stage 4 nephropathy. The sooner a patient can get their blood pressure under the control, the better the outlook is for their declining kidney function. Simply managing your blood pressure properly can reduce the decline of kidney function by 60 percent. Stage 5 is considered “end-stage renal failure due to diabetic nephropathy.” The American Diabetes Association estimates that 25 percent of the people in America with Stage 5 kidney disease also have diabetes. But “end-stage” does not mean death. Instead, it can mean your kidneys are going to require significant medical intervention in order to keep you alive. This is a home dialysis treatment that involves a soft tube placed in the wall of your abdomen or chest. It uses the inner lining of your belly (called the peritoneum) to filter and clean your blood. For most, it’s only used at night, rather than during the day. This home dialysis treatment filters your blood outside of your body through a “dialyzer” or artificial kidney. This process uses a solution called “dialysate” to remove toxins, excess fluid, and other waste that your kidney would normally filter. The clean blood is then intravenously returned back to your body. Done at a kidney care clinic or hospital, this treatment requires a “dialysis access site” to be placed under your skin. For 3 days out of every week, you’ll sit for approximately 3 to 5 hours hooked up to a machine that will clean your blood like your kidneys normally would and return it back to your body. This intensive treatment option requires being placed on the donor list, matching, and receiving a kidney from another person. The one transplanted kidney then takes over the work of your original two kidneys. If successful, it means you no longer need dialysis. Surgery, of course, is risky, and no transplant of any type of organ comes with a 100 percent guarantee of success. This is usually an option for those whose kidney failure has progressed to the point that other forms of treatment aren’t adequate. This is an end-of-life support treatment for patients who are no longer receiving (or benefitting from) dialysis. The goal of this treatment plan is to relieve the pain and discomfort that comes with kidney failure — including swelling and difficulty breathing — as a patient approaches total kidney failure. Without dialysis, a patient with kidney failure will eventually die. It’s important to remember that kidney disease is generally preventable for many people with diabetes. And for those already diagnosed, there are so many things you can do to prevent it from getting worse. The NIDDK states the following variables that increase your risk of developing kidney disease. The NIDDK recommends the following habits to prevent developing diabetic kidney disease or prevent already diagnosed kidney disease from getting worse. manage high blood pressure with medications, weight-loss, diet, etc. Every decision we make around our health impacts more than just our blood sugars and your kidneys will thank you for making good choices! If you found this guide to diabetic nephropathy useful, please sign up for our newsletter (and get a sign-up bonus) in the form below. We send out a weekly newsletter with the latest posts and recipes from Diabetes Strong.